I gotta be honest, this post is a little selfish. You see, I just really like to see your smiling faces. And when I launched this blog on WordPress, as the comments poured in I realized that many of you do not have your email set up with Gravatar, which means that next to your lovely comments is… a mystery man. That just will not do! Let’s back up a little. I myself did not know how to get my face next to my comments on non-Blogger blogs for quite a long time. Somewhere along the way I figured it out, and after that I started to notice that I got more traffic from the comments that I left because people could see my face. It’s that simple. There are millions of Kates out there, but smiling blonde Kates wearing pink? Okay, still a lot, but not as many, and I think just seeing a picture next to a comment makes you want to click on it more. I mean, if a picture is worth a thousand words… you should probably get yourself a picture. All you have to do is go to Gravatar and get yourself hooked up with a picture. It barely even requires a tutorial- just go, sign-up, and hook up any email that you might type into the comment form on a blog. Then upload your picture and assign it to your email addresses! Easy peasy. A little more about comments here (we are still in the first week, after all! ): Having an active comment section on my blog is really important to me, and part of that is having you guys get to know each other and find blogs of like-minded people. I’ve found that clicking on comments on blogs that I love is a great way to find other great blogs, and it would make me so happy if any of you were to have that experience here. One of the panels at AltNYC talked a lot about having an active comments section. One of the ideas they talked about was replying to comments on your blog in the comments section. This isn’t anything new, but the example they gave really hit home for me. One of them talked about how on A Cup of Jo, Joanna replies to comments at random. She can’t reply to all of them (and it would probably get boring to scroll through if she did) so instead she picks some and responds. I am by no means that size, but I’m kind of adopting the same principle here. If a question is asked I will answer in the comments section, and then after that I’m just gonna pick a few. I know that this is hard because you don’t always come back to the post, so I’ve gone ahead and installed the Subscribe to Comments plugin so that if you are really interested in a post or leave a particularly meaningful comment and want to know the response, you can get updates in your inbox. You also might have noticed that my new blog has pretty sweet threaded comments, and I’d love for you guys to reply to each others comments and get a dialogue going if you feel so inclined. 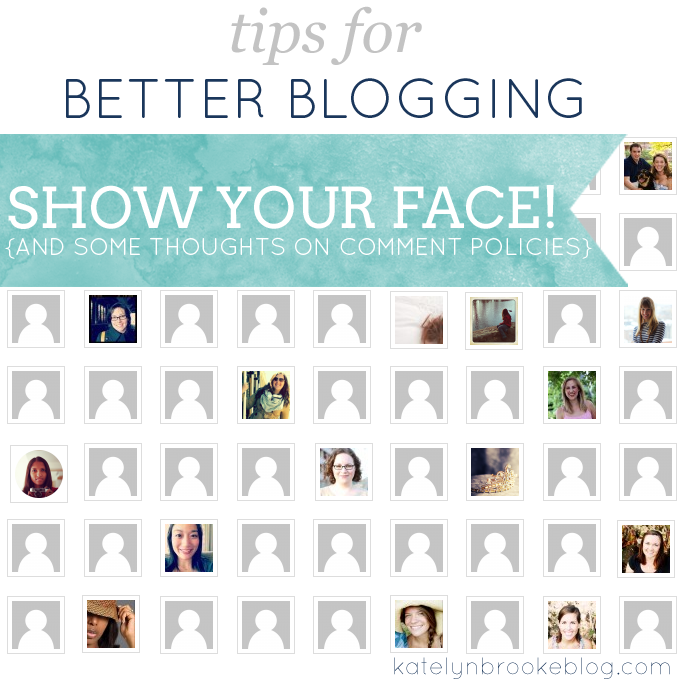 So here’s what I want to know today: what is your comment policy on your blog? I’m still testing this out, so as a reader- what do you prefer? Discuss! P.S. If you’d like to get to know the lovely ladies that I used for my graphic above, just go check out the comments on my posts from this week. Those were all the faces I could find as of yesterday afternoon- everyone else was a mystery man! b) it seems to actually END the conversation. I’d rather keep the discussion going in the comments, you know! I love that sort of engagement. I welcome any and all comments – because I don’t get many, but I try and reply the best I can. Sometimes life gets in the way. I am able to keep up with my comments because I really don’t get many. Right now I am posting replies to my blog and when I can, responding by email. I agree with Betsy though, I would prefer to keep the discussion going on the blog as it would be much easier to manage and might engage more people. I have been considering installing Disqus for that reason. Anyone have thoughts on that? I’ve never had Disqus on my blog before- mostly because I think I always thought I’d eventually change blog platforms, and I was scared that somehow my comments wouldn’t transfer if I installed it. For a long time, I hated Disqus- it made leaving comments harder for me. But then I finally made an account, and now I love it as a reader! It’s nice that it notifies you when someone responds- it’s great for someone like me who often forgets about the comments I leave! I loved using Disqus. You can reply by email and it gets posted on your blog & the commenter receives a copy of the email as long as they are registered! You can also export the comments and transfer them between Blogger & WordPress. Thank you so much for the Gravatar tip. I’m off to create my account, so you can see my smiling face. I just saw this sweet reply to my comment! Thanks so much, Kate. Made my morning. I feel like people get overwhelmed by the “I must reply to every last comment” concept. No way. If all someone says is “great post!” well what are you supposed to say to that other than “thank you” ? Not that saying thank you is worthless but I think there are other ways to show your gratitude. I’ve seen other bloggers who reply to everyone who is a first-time commenter and then do as you’ve described – reply to the really thoughtful and serious comments or questions as the situation warrants. I DO feel strongly though that if you’re going to reply to comments you need to set up a feature to email the person your reply but where your comment shows on the blog itself too – not like in blogger where it looks like you ignore everyone – so the discussion can also continue there for people who want to engage but so I don’t have to remember to check back – I follow too many blogs to remember to revisit each and every one to see if the blogger had time to get back to me. That also means you’re not obligated to reply within a certain time frame before you risk cutting off the conversation. I don’t want to actually subscribe to the comments on a post because I don’t care to see the “great post! love ya girl!” type comments other people leave you – Don’t get me wrong, I’m happy they’re saying that but I don’t need it in my email! So if you’re taking the time to respond I think you should be sure your effort gets noticed – just my two cents! When I think of a comment policy I also think of a statement that explains what your goals and rules are as far as allowing comments on the blog. I have an explanation that says I won’t let people be hateful, but that I welcome discussion even if I disagree with what the person is saying. I think that’s helpful so people know you’re not afraid to delete a comment if they cross the line but that you’re willing to hear opposing viewpoints. I want to create an environment where everyone feels safe to speak up, you know? I totally agree! So do you email people your replies in addition to responding on the posts, or do you have some sort of plugin installed that does it for you? If so, I want to know what that is because that would be awesome! And yeah, you’ll notice that I haven’t written out an explicit “Comment Policy” yet… that was something else that they talked about at Alt, but I’ve been putting it off. I need to get on it! I have a plugin that does it automatically – It’s called (so cleverly) “Comment Reply Notification” but I know there are others that do the same thing. Since you’re comfortable with coding you’ll even be able to tweak the auto-email to display what and how you want it to. I had no idea that existed! I just installed it, you’ll have to let me know if it works! I always try to respond to any and all comments that I feel either need an additional comment from me (ie: questions), or that I have something additional to say to. I’ll admit, I used to be guilty of responding to everything even if it was just with a “Thank you, X!” … but I realise that might get irritating from a commenter’s perspective, so I’m trying to chill out with that. It’s hard; one of my favourite parts about blogging is the interaction, so I always want to respond to everybody! I used to do that too on my Katelyn Brooke Designs and my Sketch and Wash posts- it’s hard, because my first instinct is to always thank people! Now I’m just hoping that they know I appreciate it :) And I feel like I’m always leaving comments and forgetting about them- I wonder how many replies I’ve missed from people on the blogs themselves! Great post! 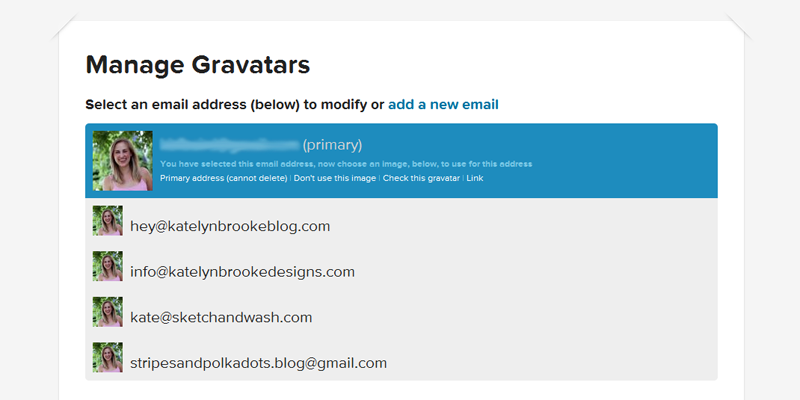 I think a lot of people, especially those on Blogger, just aren’t aware of Gravatar. And most Blogger bloggers (ha) don’t understand that by entering their URL in the website section, their name will link to their blog, so you still end up with people leaving a lot of links at the end of their comments. I try to go through my spam to make sure legit comments haven’t been marked as spam because they leave links, but at some point I think I’ll just have a clear commenting statement discouraging this and saying those comments will be marked as spam. I love the WP commenting system and wish Blogger would adopt it — I’ve never understood why you have to go through hoops to get your name to link to your blog and not your Blogger profile, which just adds a step for potential readers (though I guess that’s a completely different topic). Regarding responding to comments, I actually don’t respond to many, which makes me feel a little guilty sometimes, but I would rather leave a thoughtful response to a comment or answer a question than simply say thanks/agree to every comment. I hope that my readers know I value their input, but I don’t think it really adds to the conversation for me to say thanks/agree when someone says they love my picks or things like that — I still appreciate those comments, but at that point, the conversation has naturally ended. Aaaaaaaand congratulations to you if you made it to the end of this ridiculously long comment. I didn’t realize that WP marked those comments as spam until I luckily noticed a legit comment in my spam box yesterday! I went and registered, I hope it shows up! When I click “notify me of followup comments” are those only replies to our comment, or all comments? Okay, it didn’t show up. That’s annoying! That’s weird! Maybe it takes a little while to show up? And I think it gives you all the comments, unfortunately. I’m a huge fan of receiving replies by e-mail. It ensures that I see the response, I guess. I’ve subscribed to follow-up comments, but then I have to to go my e-mail to confirm the request. It doesn’t seem like much time, but I used to do it with a lot of blogs, and it became a nuisance. Now I only subscribe to follow-up comments if I explicitly asked a question. Hi Kate! I’m a relatively new blogger, so I respond to all the comments I receive on my blog page and also visit the commenter’s blog… but I totally understand that this isn’t practical for bloggers who get a lot of comments, and I still leave comments on their pages anyways! I don’t have the Disqus system set up on my blog currently, but I’ve used it as a reader of other blogs and really like it! ok did gravatar! Am I seeable? A couple of people seem to be experiencing a delay in it showing up, and I’m not sure if it shows up for comments that you’ve already left after you activate it. I haven’t done it in a while, but I think they send you a confirmation email that you have to click through to activate it, and after that I think it’s just a waiting game! I definitely respond to every comment that is posted. I have the time, so why not? =) I like to think that my responses are like mini conversation with my readers. I learn so much by what they share with me! I had never heard of gravatar before, so I’m so glad you shared this!! Since I use blogger, I respond to comments via email, especially if the commenter asked a question. As a reader, I want to know if the blogger responded via email. I don’t typically go back to the blog to look for a response. The only thing I don’t like about most commenting platforms (and why I use Disqus) is that it doesn’t notify me when the blogger has responded to my comment – if they did. I only really care if I ask a question, but like Kate, I read way too many blogs to go back and check and see. And I don’t want to subscribe to all of the comments that other people put on the post – especially some of the larger blogs. While I do not expect a response to my comment, if I look at a blog and I see they never ever respond to a single commenter, it makes me think “ah, they don’t care about comments.” While that blogger may be emailing people thank you’s or responding to their question behind the scenes, how are we to know? And if I have the same question as a reader, it would be helpful to just have the answer right there. Im particularly passionate about people using their picture – it’s so easy! Like you, I love to meet like-minded people through comments. That’s how you and I met! I heart your new plug-in! It worked! I think the “notify me of followup comments via-email” is misleading because I consider a followup comment a response to my own. To me, that box means “subscribe to all comments on this post.” I think it’s good to have options because some people like to read all the comments, but, maybe the wording can be revised? I bet that’s something you could do? Good call! It does let you edit the text- I just changed it! Thanks Lauren! I totally see your point here. I think it’s great to have discussions on your blog with commenters, and I definitely understand why some people might think comments don’t matter or are ignored if they don’t see a reply. For me personally, and especially since I’m on blogger, I still like to email my reply. I usually have great conversations and in my opinion it’s easier to facilitate conversations that way, plus it feels more personal to me. And I don’t want every single conversation to be public and for the whole world to see. But that’s just my own personal opinion! I think it’s just a personal preference thing, and that’s totally cool. I think it all depends on the type of blog and blogger and all that jazz. Comments seem to be a tricky thing. I’m not a big fan of replying to comments via email. Sometimes I have the same question that someone else has asked, and if the blogger would just reply publicly, then I wouldn’t have to ask the same question. But at the same time I know that people rarely check back to see if their comment was responded to. So I use the comment reply notification plugin which solves the problem! Great post by the way! With so many people on Blogger there sure are a lot of mystery men! If the blogger is not overwhelmed I always like to see a reply to a comment as a reader. I agree but if it appears to be a well thought out comment and a blogger replies to it my guess would be that the blogger would build faithful reader’s that way. I feel that way as one who comments. The worst thing to do I think is to comment on 90 percent of the comments and leave a few without. Those few if they check back I am sure wonder why they did not rate a response. I am sure a blogger to some extent judges how they did on a post based on the number of comments and a person who comments judges his comment based on did it elicit a come back response. That’s true- I try really hard not to do that, but if I’m not careful it still happens occasionally! I try to make sure that if that happens I reply to that reader’s next comment. But admittedly I’m not very scientific about it, I’m still figuring it out! So I just left a comment on another post and was sad that I did not have a picture. Then what do I find, but this post telling how to finally do it! Thank you so much. Now you can (hopefully) see my bright and shiny face. Thanks again for these helpful hints. I would be so lost! I’m testing to see if my avatar image shows.